Save Joel to your Collection. Register Now! 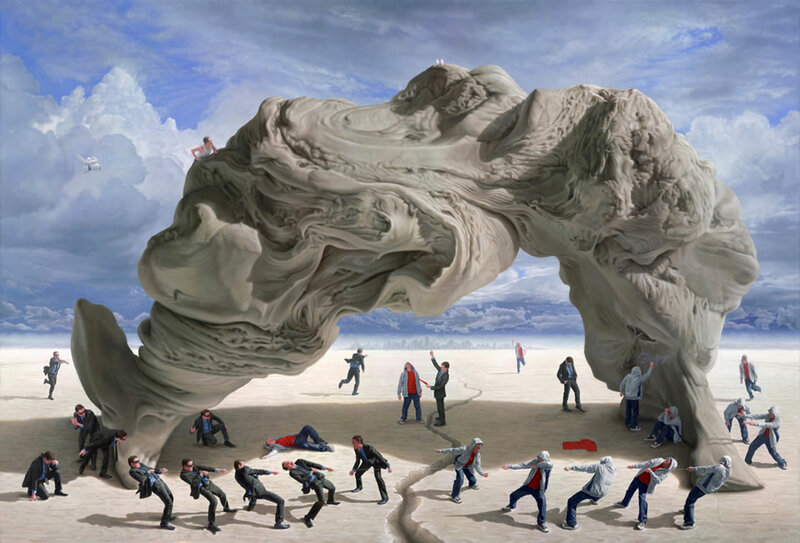 Fascinated by the natural world, Joel Rea paints the elemental forces of our planet inter-playing with human relationships existing within our environment, society and are own consciousness. Very much driven to explore universal meanings around the human condition, Joel is interested in the underlying forces which drive human behavior, especially his own. He attempts to present those narratives visually through the use of metaphor and self portraiture. 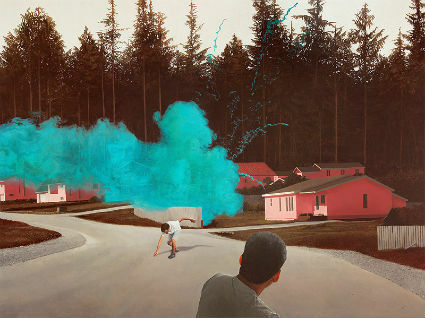 Joel also harvests ideas from his own dreams, and uses his own personal story of struggle, that of clinging on to his life long ambition to be a professional painter, an ambition which was many times nearly derailed by the unpredictable turmoil in his years coming of age as a young man. 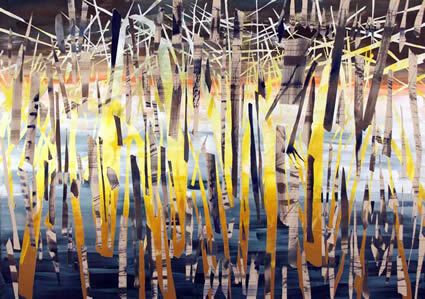 Joel’s commitment, work ethic and focused passion for painting prevailed and he was met with immediate success upon exhibiting his work in a commercial gallery space in 2004. Slowly executed with an impeccable skill level, his technique requires long hours of intense concentration, with some of his finest brushes containing only several hairs. The surface result of his paintings are a smooth finish, saturated with details demonstrating his mature abilities as a painter both thoughtful and technical. He is driven to create the strongest aesthetic result possible within his work by committing long hours into pre-visualization and design. Joel obsessively sources through all different types of media to find references needed to make his paintings, he stages photo shoots and meticulously edits in the design process until confident enough to commence painting which then needs to meet his own personal level of satisfaction before completion. Some endeavors have seen Joel spending up to 700+ hours on one painting alone. that's so cool how did you do it? Undulation in grey, red and blue...lovely color palette! Is there an object hovering, sky left, in "Monumentum?" The detail is AMAZING! 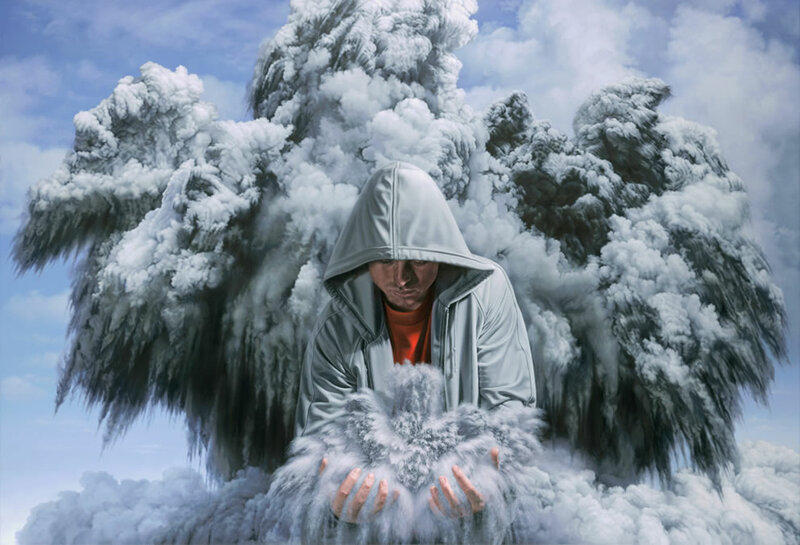 I love clouds and Joel Rea captures their beauty so perfectly! Thank you Joel! I will thoroughly enjoy looking at your artwork for some time!